ETM is not just few tools and techniques to be more productive, but a way that creates a lasting good change in the quality of life. ETM is to stay disciplined. ETM is not a result of technology, in fact it is ironical that history proves that people of the past achieved in same number of hours, days, months and years tens of time more than what we achieve today. They did not use laptops, smart phones, tablets and latest software! Technology alone will not make you productive, it will only help if you know how to manage time effectively. If you know the timeless principles of productivity, that existed and are in use for centuries, even millennia and they have not changed. In order to be disciplined and committed one needs to have a living “why”, a living “vision” in one’s life. A vision, not residing somewhere outside but resonates with one’s heartbeat. One has to have an emotional linkage with the vision in order to be consistent and firm with perseverance. “Picture of the future that one wants to see”. A vision is and must always have roots deep inside one’s purpose in life. A vision without a purpose has no point pursuing and is not sustainable. Such a vision fails to fuel the passion enough that could sustain continuous effort. Vision is sometimes called a dream, but it’s never wild for it to qualify to be called a vision. Some necessary attributes are: its possibility of achievement with available resources or available capability to gather resources. Of course, it does not limit the possibility of stretching oneself to achieve what does not seem to be achievable to someone else. Other is the clarity of the vision, which means that the picture of the future is articulated in unambiguous terms and their level of achievement is measurable. We all experience the kind of people who define their visions in unambiguous terms and consistently achieve them and there are people who daydream a fancy future that never comes. First is a Vision; second is a mere Wish. Other is the scale of the vision. How it stretches in the 5 dimensions – 4 dimension of space and time, 5th is the hereafter. Nobility is one essential attribute that reflects whether the vision oriented around the sole self or it touches other’s lives as well. Another important attribute is the level of sacrifice that is required to offer in order to realize a vision. This needs to be identified and this needs to be committed to. Without this commitment, it will remain a fanciful wish, not a vision. The vision has to be correct as well with respect to one’s ideology of life. Some of the big fruits of vision are that it gives a continuous direction to one’s life, it allows a criteria and an ability to take decisions, it reduces risks of facing unwanted situations, it provides great motivation to keep moving and provides a foundation for perseverance, it helps in selecting only those roles in life that are aligned to a correctly defined vision. One of the greatest of all benefits is that a personal vision protects one from being used and becoming a tool in the achievement of someone else’s vision that could be in conflict with one’s ideology. Just as there are attributes of a vision, there are personal attributes that make one worthy of achieving it. One is a personal commitment to give what it takes to achieve a vision. Second is the ability and discipline to prioritize, which means four decisions: what not to do, what to do, what to do now, what next. A word of caution here is that usually people mistakenly consider something that is the worst enemy of effective time management as the best tool of achieving it. Unfortunately, the epidemic is too widespread. Multitasking, taken as an effective way of productivity enhancement is actually its worst killer. There is no real multitasking that actually happens. Our brain is actually not capable of processing two tasks simultaneously at a “conscious” level. What it does, is switch-tasking, which means a continuous shift of focus from one task to the other. Personal experiences and researches have proved that sequencing tasks by giving them enough time to complete provides much more productivity than doing what we mistakenly call multitasking and think to boost productivity. Three major effects of multitasking are: increased time to complete, increased levels of distress, and decreased quality of work performed. It is important to know why one tends to or more rightly lured to multitask. It is because of the absence of a gathering space – absence of organization. It is a usual experience that if you put multiple objects of attention on your table and start working on them, your smart brain will keep shifting its attention to the objects that are on your table other than what is just in front of you. Experience it. Now put all the other objects aside, clear your table of everything other than what you are working on, and you will experience a great deal of productivity and quality improvement. The cluttering of the space we work in with unnecessary (unnecessary in that very moment) objects is a big cause of productivity fall. The other cluttering place is our mind. There are a whole lot of things we want to do today, tomorrow, day after, this week, next week, next month and you go on and on. Our smart brain provides us its best service by not allowing any of these things to go far from our memory. So it keeps remembering them every now and then. Result is a continuous shift of focus. Which again results in decreased productivity, increased distress and poor quality of work. This habit of cluttering goes into one other big area of our lives. Cluttering of time allocation. Since nothing is planned, so nothing is allocated its due time share in our day. This again results into too much time here and too little there, and the result is a rolling stone that gathers no moss. Too much distance, too little displacement; too much effort, too little achievement; too much distress, too little happiness. De-cluttering the SPACE, MIND and TIME is a big milestone that one needs to achieve in order to do any meaningful time management. 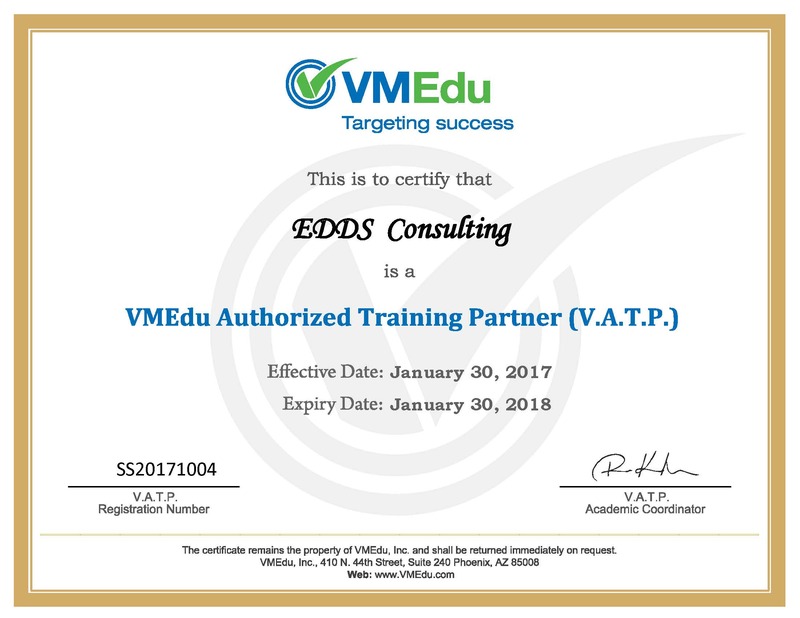 EDDS Consulting offers the Effective Time Management training that facilitates to achieve this big milestone through three great de-cluttering tools; one each for space, mind and time. Third personal attribute is one’s ability to fulfill one’s commitments with self and with others. It’s unfortunate that this is something that we are not in a habit of doing usually. Nevertheless, a cure will never follow unless a diagnosis is not done and accepted. Habits are mental scripts that home in our sub-conscious mind and are a result of continuous practice, by our-selves or by our immediate parents or ancestors. They can be a result of our continuous observation in our immediate environment. Mental scripts can be Good and they can be Corrupt as well. Changing a habit is not easy. What you attempt is to pull a corrupt mental script out of the sub-conscious mind and this never happens unless a replacement is provided. I would emphasize this fact. This will never happen unless a replacement is provided. So, in order to root out a corrupt mental script one has to sow and nurture a good mental script and consciously refuse to follow the commands of the bad one. In this training, we will discuss this in detail and will take up three deadly mental scripts that actually ruin people’s lives. We will also discuss a common psychological disorder (in the past it existed mainly in children, now very common in adults as well) that results into capriciousness, which is a big obstacle in the way of achieving effective time management. Fourth is the ability to lead. We grow from dependence to interdependence in our lives. People have different visions or at least they have a sub-conscious realization of what they do not want in their lives. This makes us all different from each other. We assign importance to different things differently. Things important for one may be completely un-important to someone else. Achievement of visions is rarely a solo flight, only God has no supporter in His works. We all need support and collaboration. Leadership will mean an effective sharing of the vision that results in creation of a group of people who think about the vision as dearly as the leader does. Next is providing the people a source of continuous motivation to sustain that relationship with the vision and third is the process of delegation. The process of delegation is a 5 step process that unfortunately is commonly reduced to a 2 step process which is “I do” and then “You do”. So delegation has reduced to throwing away something on someone … I call it Relegation. We will see the big difference between delegation and relegation. Fifth is the balance of roles in one’s life. We all have roles in life, some are mandatory that can never be detached till our end. Others are roles that we voluntarily adopt. One of the major factors why people – who may be very smart in all other areas that we have covered so far – fall, is the unbalance of roles in life. A person is as strong as his weakest role is. We will discuss the balance of roles in life and their dynamic relation with the achievement of visions. Sixth personal attribute is the continuous effort to achieve excellence. Excellence is the ability to do best that can be done in available resources. We will discuss the ability to say “NO” and “Stress Management” under this. The practical framework that puts all the unique pieces together is an Effective Time Management Framework that makes the journey from “dream” to “reality” possible.